Reductil Review: Is it Safe? Reductil is a weight loss product, known also as a “satiety enhancer”, that allegedly helps keep the consumer full by tricking the brain into thinking it doesn’t need to send “hungry” signals to the body. This unique approach to weight loss caught our eye and our team was thrilled to research this product and see what further information we could dig up. Reductil works by blocking the nerve cells responsible for the release and reabsorption of serotonin, a neurotransmitter that contributes to feelings of well-being and happiness. By this tactic, the serotonin levels are ultimately increased and act on the brain to enhance feelings of fullness, or satiety, and thus consumers of Reductil will eat less and lose weight. Moreover, the product comes with a “Change for Life” program, a 12-month package that provides motivational support and healthy lifestyle tips. Reductil makes no promises that you will lose weight while strictly only taking these supplements. The makers of Reductil state that their product should be taken in conjunction with a reduced calorie diet and a fair amount of exercise. So does it work? In conducting our research we discovered a study showing that with Reductil, when taken in combination with a reduced-calorie diet and appropriate physical exertion, approximately seventy-seven percent of testers achieved their weight loss goals. Throughout the study the most commonly reported side effects were insomnia, constipation, dry mouth, flushing of the face, and spikes in blood pressure. However, we had a hard time verifying the study because the university or independent laboratory that where it originated was not listed. But in our search we did uncover some disappointing news. 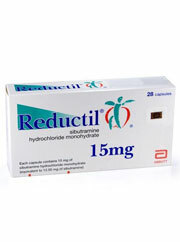 Since Reductil was put on the market in 2001, there have been over two thousand adverse reactions to the product, as well as seventeen deaths associated with Reductil. Seeing as six of the deaths were associated with heart problems and stroke, people currently taking the drug are strongly advised to make routine appointments with their doctor. Moreover, this product costs about $85 dollars for a month long supply - certainly not cheap - and should only be taken by the morbidly obese who have exhausted all weight loss options and are in close contact with a good doctor who can prescribe Reductil to them. Utilizes interesting science that works on the serotonin levels in the brain to keep the consumers stomach “feeling” full. Very expensive and has a multitude of adverse side effects and even links to death, which explains why Reductil had to be taken off the market and is now only available through a doctor’s prescription. Recommended for the severely obese with a Body Mass Index (BMI) of about 30 or more. Reductil is not for the casual dieter, nor the intermediate dieter, or even the most extreme dieter, but rather for the razor thin percentage of the morbidly unhealthy, obese consumers who have exhausted every other option available to them. Although this drug may be effective, it is also potentially dangerous and can only be prescribed by a doctor. Additionally Reductil is quite expensive and in our recommendation the consumer would be better off going with a cheaper product that is available over the counter. Bottom Line: Reductil was taken off the market for a reason and should only be considered as a last resort - do not take this product without the recommendation of a doctor and a decent amount of money in your pocket.